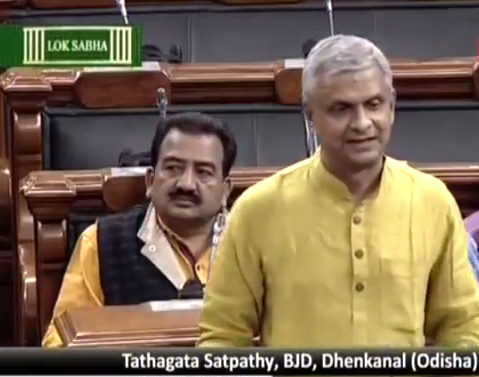 While participating in a discussion on ‘The Industries (Development and Regulation) Amendment Bill, 2015’ in Lok Sabha last week, BJD MP from Dhenkanal, Mr. Tathagata Satpathy sought a clear policy on the use of alcohol so that it does not cause damage to any particular state or young people. He also argued that ban is not the only solution. Citing the example of Gujarat, which has a ‘zero tolerance’ policy towards alcohol, Mr. Satpathy revealed that the ban has completely damaged the economy and people in the state although rosy pictures are being shown about the ‘Gujarat Model’. “Despite the hollow claims made by the government and politicians of a particular party, everybody is aware of the fact that alcohol is available plentily in Gujarat and touts and hooch dealers are having a good time there. You can find them in all street corners. The most shocking part is that they even take orders on phone and ensure home delivery of alcohol”, he added. The BJD MP opposed the use of alcohol, saying that is detrimental to the society. At the same time, he sought a clear policy so that it does not affect the states and the youth. He cited several examples of atrocities on young people for taking alcohol and described how their future is being destroyed due to police excess. “A ban does not help the society whether it’s alcohol or marijuana. What needed is a clear policy to prevent drug or alcohol mafia from taking advantage of the situation. We all agree that alcoholism is linked to violence, increase in crime rate, atrocities etc. It kills the thinking process of the youth. But, we need to find out the root cause of the problems too,” he added. “The centre has a bigger role to play here. It must advise and assist states not to impose a blanket ban on alcohol. If there is a ban, then it must be ensured that illicit alcohol is not transported from the neighbouring states, where there is no ban. We must have a strong system to ensure that. The ban should not be limited to a few states. It should apply to all states,” said the BJD MP. While concluding his arguments, Mr. Tathagata Satpathy urged the centre to allow the states to formulate their own policies with regard to alcohol use and play the role of an arbitrator, not a big brother.